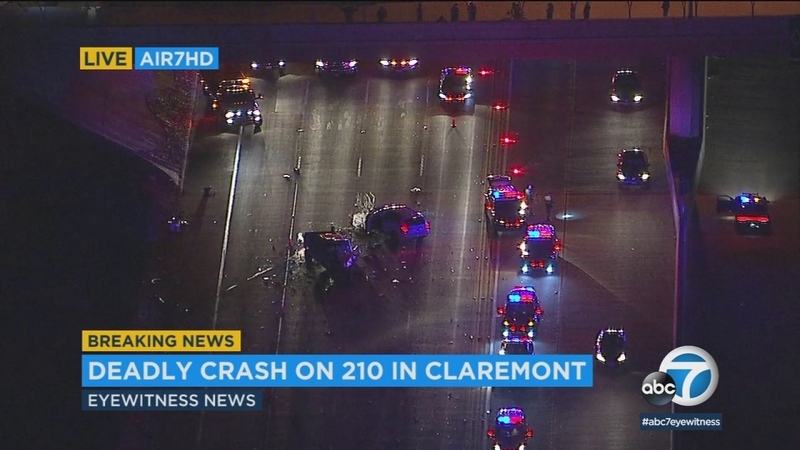 CLAREMONT, Calif. -- A collision triggered by a pursuit suspect going the wrong direction on the 210 Freeway in Claremont near Indian Hill left one person dead and multiple others injured Monday, police said. The 28-year-old driver of a stolen silver pickup truck was being chased by officers in a pursuit that started around 3:25 p.m. in San Bernardino, according to police. The female suspect, identified as Nicole Thibault of Santa Clarita, jumped into the truck in a 7-Eleven parking lot after its owner got out, according to authorities. The owner's 2-year-old was inside the truck at the time. Police said Thibault dropped the child off unharmed not far from the scene of the carjacking in the 700 block of Highland Avenue. "She removed the child seat, put him on the sidewalk and continued on," said Sgt. Saul Gomez of the California Highway Patrol. At some point during the pursuit, the suspect entered the 210 Freeway and began driving westbound in the eastbound lanes, where she eventually struck multiple vehicles head-on. "The impact was so severe that some of the vehicles are unrecognizable," Gomez said. Witness Rioni Lewis said he saw a truck "coming at full speed -- it was probably going at least, I would say no less than 105, 110 miles an hour -- and barely missed me." The speeding truck was "literally in the lane right next to me," Lewis said, describing his close call as "one of the most terrifying things I've experienced in a long time." The violent crash blocked all eastbound lanes of the freeway as rescuers rushed to extract victims from vehicles. A 69-year-old Fontana resident was killed in the collision; his name was not immediately released. Thibault was listed in critical condition after being pulled from the badly damaged pickup truck, police said. Four others sustained minor injuries. Traffic was backed up for miles as an investigation and cleanup operation got underway at the scene. Eastbound lanes of the freeway were expected to remain closed until at least 12:30 a.m., the CHP said. Toxicology tests are pending to determine if Thibault was under the influence of drugs or alcohol during the incident.